The iPhone is the new mirror. I hand it to my little girl with the camera facing her when I want to entertain her. She looks at herself, then turns the phone around to see how she is seeing herself. It is cute. 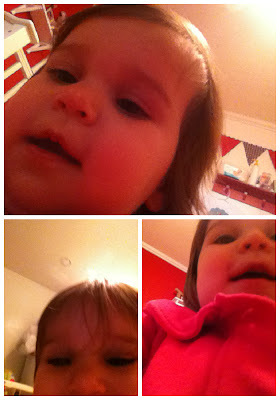 And every once in a while, she manages to take a self portrait. I die. I know, something only a mother could love. But come on, I know you are loving it too. I mean, most of the time, my camera roll is just filled with artsy shots of the ceiling fan, so whenever I see that chubby little face, my heart melts. 'Artsy shots of the ceiling fan' AHAHA! I laughed out loud at that one! She's adorable!